To overcome is to set creation free; it is to subdue all things. Setting creation free comes only out from the tree of life, only out from the throne of God. Being born of God comes first; believing that Christ is our only life comes first. Faith is the only come-over to the tree of Life. Hebrew is very different from English. Translators must fill in between the blanks all the time. Ancient Hebrew has words that have no English counterparts, while at the same time, it leaves out essential words to the flow of thought that English requires. The Hebrew in verse 28 gives three specific commands: 1. Fill the earth. 2. Subdue (IT) 3. Rule over the animal kingdoms. The verb “fill” has an object – the earth. The verb “rule” has an object – the animals. But the verb “subdue” does not. Thus the translators inserted the word “it,” causing us to think that God said: “Subdue the earth.” And thus I have said it all through my writing until now. God did not say, “Subdue the earth.” He said, “Subdue.” It's not that the earth is removed from that subjugation; it's that “subdue” is without limitation. Thus the writer of Hebrews said, “All things are made subject to man.” And Paul said that only the Father is outside of that scope. Let's bring in three references to get a larger picture. The best picture of the concept of “subdue” is found in Joshua 10:24-25. The word, “subdue” or “overcome” is the action verb of God's great story. Here is the strongest verse in the Bible on subjugation, Philippians 3:20-21: For our citizenship is (of) heaven, from which we also eagerly wait for the Savior, the Lord Jesus Christ, who will transform our lowly body that it may be conformed to His glorious body, according to the working (energia) by which He is able even to subdue all things to Himself. Then Hebrews 2:6-9: “What is man that You are mindful of him. . . You have. . . set him over the works of Your hands. You have put all things in subjection under his feet.” For in that He put all in subjection under him, He left nothing that is not put under him. But now we do not yet see all things put under him. But we see Jesus. . .
Jesus is Man, that is, God revealed. All things being subjected to Him means all things under our feet. “Till His enemies are made His footstool” is from Psalm 110, the Psalm of the victorious Messiah. This line is the most quoted Old Testament verse in the New Testament. There is a problem in the thinking of many who say, “Union with Christ.” That problem is limitation. It is simply beyond us to grapple with the reality that union is union. The moment one says that word, “Union with Christ,” it is absolute and complete, there can be no limitation. If I am in Him, show me where He continues and I do not. If He is in me, show me what part of Him is not. If I am filled with all the fullness of God, what part of God is absent from me? If God flows out from me in rivers of living water, what part of those rivers do not come out through me? The churches in Revelation:Every truth in each letter to each church is true of every local church and every world-wide generation of the church from Pentecost to today. That is not union. If God rests, I rest in Him; if God does, I do with Him. I can do nothing apart from Him; God does nothing except through me (that is, through His body). If Jesus subdues all things to Himself, I subdue all things to myself, for He and I are one. It is He in me doing it; it is I in Him doing it. All things that He does, I do, for I do not seek my own, but the will of the One who sent me. Union cannot be anything less than union. Oneness cannot be anything less than oneness, I in Him and He in me. This is the chair upon which we have seated ourselves. Yes, we have no business here, but here we sit. We have nothing to lose; we have nothing to gain. All we have is the Desire of God filling our hearts. We speak Christ our only life. If it's true of Jesus, that's all I am, that's all I do, that's all I could possibly be. I am not alone; God fills me full; the Word is in my mouth. In my last letter, “Christ, God's Story,” I used the seven churches in Revelation 2 and 3 as a template describing the history of the church over the last 2000 years. That is an idea I obtained from elsewhere, and, being an amateur student and teacher of history, I fitted the template by my own understanding. To my surprise, it worked. In fact, the more my understanding of things increases, the more that template fits. However, in itself, using the seven churches to describe church history is just an intellectual exercise with little value. What it does give us is a framework through which to see the great story of God unfold from Pentecost until now. By that means using these chapters in this way is useful to us. However, this is only one use the Holy Spirit makes of these seven churches, and thus such an “interpretation” cannot be written in stone. Every truth in each letter to each church is true of every local church and every world-wide generation of the church from Pentecost to today. Christ is Christ in all who belong to Him. Let's stop here. – I attempted to continue in the “Bible Study” mode, bringing in the seven verses of overcoming from Revelation 2 and 3 and highlighting various symbols. Then I realized I was not catching the reality of Christ we must have right now. I thought to start over, but decided to keep these first two pages as a foundation. Having laid that foundation, let's see where Christ our life will take us. For me truth does not show Himself by plowing straight on through cold logic, but rather by lateral leaps in unexpected directions. I have just recast this series on John's vision as “Through Eyes of Fire.” That will be the title of the book. There is so much in that metaphor that I sense in my spirit, but that I do not yet see. I want to see. Subjugate all things – Stand fast in liberty – Labor to enter His Rest – Overcome the Beast. God brings all things under submission by setting everything free. God sets everything free by bringing it all under submission. God labors to enter rest; great works come out of God's rest. The Guy is confusing. Overcome is outward, not inward. We do not subjugate “the flesh.” To subjugate the flesh is to get Christ solidly under our feet; that's upside down. 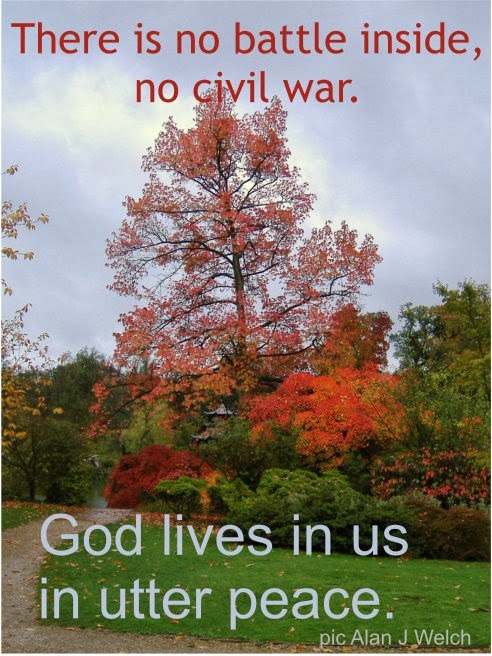 There is no battle inside, no civil war. God lives in us in utter peace. One of two things happens if we imagine that we must bring ourselves under subjection to God. Far better is it that we collapse in failure and ruin. But not all do, some succeed by outward appearance to make “themselves” subject to “Christ.” That is not what happens inwardly, however. What actually happens is that they bring an “image of Christ” held in their own minds fully under the control of self. And now this dedicated Christian is at war with God, with no reason whatever to be so. The flesh belongs to God; it is the eternal dwelling place of the Father. It is the one thing we have no right to subjugate. The only entrance into Life is for us to allow Jesus to BE our flesh, flesh of His flesh. Overcome is outward. Overcome is the action coming out of our seamless union with Christ. To overcome is to set all creation free. Subjugation with God is to bring all things into the Mercy Seat, into the Lamb-Slain where all offense is caused to cease and where the object of love is released into honor and joy. This is the operation of God's throne; it is how Jesus subdues all things to Himself, by mighty energy. Overcoming does not “get us to” the throne; overcoming, subjugating all things, is what comes out from the throne. Only those who seat themselves upon that throne, by daring boldness, by audacious presumption, by having nothing to lose, counting the Blood, the Cross, the Resurrection of Christ to be absolute, to be larger than all things, to be complete, it is only those who then bring all things under subjection. To overcome is to bring all things under the power and into the freedom of Love. To overcome is to be the tip-point of the Pillar of Fire as it carries all things into Life and Love. Okay. I've said all these words because they are what God has taught me to say over the last couple of years. But suddenly, my seeing changes. I see what I am saying; I see through eyes of fire. We have carried a completely backwards definition of “to overcome.” Indeed, I have addressed our wrong seeing over and over, yet continued to think partly in that backwards way. The problem is not ours, though, but how God words things. To him who overcomes I will give to eat of the tree of life. . .
You do this first, then, after that, you will get life. But without life, how do we do the things of life? Without life, how can we even know what life is? It is the veil, placed there by God to keep out those who do not belong, those whose hearts are not given wholly to Him. But we? We have already proven ourselves incapable failures in the things of God. We have nothing to lose. We just plant ourselves in that throne, in that Life, in the Christ of God. Then, sitting there, we discover that we are completely turned around; we are now looking out from God, through eyes of fire, at all things. To overcome begins by eliminating every thought of “going into God” from our minds. To be “going into God” is, by definition, to be outside of God. Outside of God has a name; it's called rebellion. There is only one possible way, however, by which we can BE inside of God utterly and only – by faith. Those who insist on continuing on “into God” live in unbelief and can never know Him. You know, really, almost all firmly believe that Life must be earned. They believe that to sit upon the throne of heaven by faith is illegitimate, that we cannot “make such claims” because we have not yet “earned” life. Not sitting upon the throne by faith has a name: rebellion. The only thing being earned is death. In complete contrast, in all things, in every circumstance, at every moment, God in us and we in God are going out together, always seated upon the throne, always moving out from that throne as rivers of living water setting all things free, which is, by definition, bringing all things under subjection. Never see yourself “going into” God. Always see yourself utterly IN God, looking out through eyes of fire and going forth as God Himself into all the circumstances of your life. This reality is NOT real by how we feel or by outward sight. It is real by faith. The Word is in our mouth. Let's look at the whole verse. This is one of the “gospel road” verses. One of the key verses in the gospel tracts and known by all believers. Yet we had no idea what we were saying. Now, seated here upon this throne of heaven, looking out through these eyes of fire, I hear the words, “The Word is in your mouth, the Word is in your mouth, the Word is in your mouth,” going through me over and over. God is in my mouth. God is in my mouth. I want to look again at a line I addressed in “Union with God FIRST,” the first letter of this series. This is the mind in which we once lived; it is 180 degrees backwards. Here is the truth. Death does not produce life; life swallows up death. I want to do two things here. First, I want to put before our eyes the verses of overcoming in Revelation 2 and 3. I find no unction to deliberate over any specific meanings. If and when I do find particular things from these verses flowing into the present word of Christ, I will, but not until then. Second, I want to bring all this thinking back into the seeing of the final chapters of my book, The Covenant. Here are the overcomes. I have put them in this form as a means for us to see the picture God has placed before our eyes. I don't know what all this means; we simply hold it as Christ in our hearts. These things says He who is holy, He who is true, “He who has the key of David, He who opens and no one shuts, and shuts and no one opens”. . . He who overcomes, I will make him a pillar in the temple of My God, and he shall go out no more. I will write on him the name of My God and the name of the city of My God, the New Jerusalem, which comes down out of heaven from My God. And I will write on him My new name. Could these things be written backwards? Would this be a better way to say what God means? He who eats of the tree of life will overcome. He who has My name written upon him will overcome. He who sits in My throne will overcome. You see, it seems to us that Jesus said, “Look, if you defeat sin and death the way I did, then I will put you where I am now.” Yeah right. I once sat under a man who has preached it this way now for over forty years under a mighty anointing with great convincing argument. The ONLY hope there is for him is to face the truth, “I have failed.” And having failed to just be where his heart wants to be. Where that is, I don't know, but it's the only thing real. The first step of overcoming is found in these words, “I have failed; I know I can never 'overcome. '” The second step is: “Christ, You are my only life.” – God is in our mouth. Do you see why I say that the only way we could possibly understand John's vision is to see it entirely through 1 John? To overcome is to set creation free; it is to subdue all things. Setting creation free comes only out from the tree of life, only out from the throne of God. Being born of God comes first; believing that Christ is our only life comes first. Faith is the only come-over to the tree of Life. Now, God is very practical. One wonderful thing that Pastor Joel Osteen continues to do for me is to remind me to think the expectation of God instead of that old familiar fallback, thinking curse. Another is that God reigns in goodness in all the little things of life. Speak Christ concerning all things, especially the little things of everyday life. 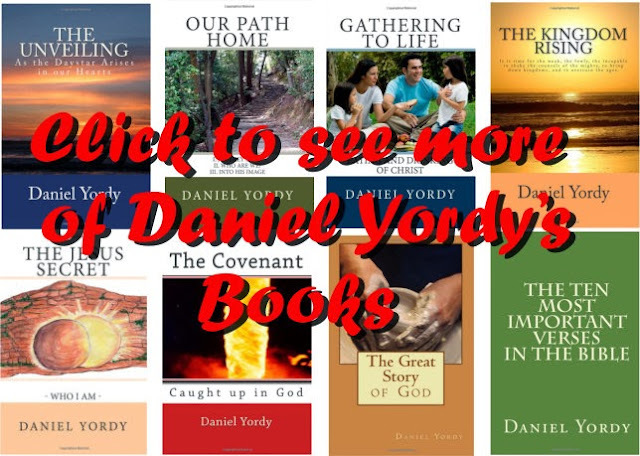 Now, in the final chapters of The Covenant, there is a progression of seven key chapters: The Ark of the Covenant, Carry Your Cross, Resurrection Life, A Heart Throne, The Mercy Seat, Until My Enemies, and The Pillar of Fire. In the center of that progression is the throne of heaven in Revelation 4 and 5, a heart throne, the Lamb-Slain. Our heart is the throne of heaven, the Mercy Seat, the throne of God. Out from our heart proceeds all authority. Yet that great authority IS a gentle touch, a tender word, a cup of cold water. It swallows up into itself all the little things of life, all the ordinary circumstances. At least, that is what is visible outwardly. But in the heavens, what a different scene is taking place! As we bring all the ordinary things, the little things of life into the Mercy Seat of God, the universe is forever changed. Life swallows up all death. You see, those who are forever “going into” God, are forever seeing backwards. Let's turn around, seated comfortably here where we have no earthly “right” to be. Let's look out through eyes of fire. From the throne proceeded. . . voices. – The Word is in your mouth. We see through those seven lamps of fire, each one of the seven Spirits of God. And each one of those seven Spirits of God attends one each of the seven overcomes. You see, having turned around, now we proceed as heaven proceeds, not as earth sees in its blindness. We see out from that throne, our hearts, through the Spirits of fire to all overcoming, to all bringing of all things into the Mercy Seat, into the Lamb-Slain. There shall come forth a Rod from the stem of Jesse, and a Branch shall grow out of his roots. The Spirit of the Lord shall rest upon Him, the Spirit of wisdom and understanding, the Spirit of counsel and might, the Spirit of knowledge and of the fear of the Lord. His delight is in the fear of the Lord, and He shall not judge by the sight of His eyes, nor decide by the hearing of His ears; but with righteousness He shall judge the poor, and decide with equity for the meek of the earth; He shall strike the earth with the rod of His mouth, and with the breath of His lips He shall slay the wicked. Righteousness shall be the belt of His loins, and faithfulness the belt of His waist. God is in your mouth. First, lets not turn these seven Spirits of God into word studies and principles. Let's allow them to remain Fire and Life. And second, before we attract any psychopaths, Jesus does not “slay the wicked” by killing people. He slays the wicked by bringing them into Himself and carrying them through death all the way into life. There is only one death for us and that death is entirely WAS dead – the Lamb Slain, and now alive forevermore. Christ causes wickedness to cease by the word of His mouth, the breath coming out of His lips. That's our mouth, that's our lips. The Word is in your mouth. Do we love people? Of course we do; Love fills our hearts to overflowing. God says He does, and He always tells the truth. Let me become specific. I write for clarity, not to be offensive, but to shine the light upon our own hearts. Once in awhile I shop at our local Walmart. Our Walmart is centered amongst poor people. It is filled to overflowing with Hispanics, Blacks, and local white “trash.” Most of them are overweight, plus. They fill their carts with white flour, white sugar, and genetically engineered corn, all laced with innumerable man-made chemicals. I am always astonished that there is enough life left in their bodies to push their carts of death out to their cars. I suspect that the productivity coming out of these people is fairly low. Yet, astonishingly, they are among the richest people on earth and in all human history. Before we attract any psychopaths, Jesus does not “slay the wicked” by killing people. He slays the wicked by bringing them into Himself and carrying them through death all the way into life. There is only one death for us and that death is entirely WAS dead – the Lamb Slain, and now alive forevermore. Christ causes wickedness to cease by the word of His mouth, the breath coming out of His lips. That's our mouth, that's our lips. Now, there is a mind-set in this world, particularly among the elite and powerful, that would call all this overflow of stuffed, “low-socio-economic,” “minority, that is colored” people “useless eaters.” More than that, these people are hooked to their television sets, to government handouts, to modern education - “think only what we tell you to think.” Many would call them “zombies,” “sheeple,” etc. etc. The planet is filled with billions just like them. Billions who will never pursue life, never overcome, never rise above their fleshy dump. Yet I walk through the store marveling in my heart. This fattest, dumpiest one, cart and mind filled to overflowing with junk, though shadowed by sorrow and darkness, is still the image of the Almighty, utterly loved with tender regard by the God who fills our hearts full and of more value than all the wealth of the universe. God loves each one; we love each one. We lay down our lives; we speak Christ, and the Word coming out of our mouths causes iniquity to cease and causes the object of our love to walk free, carried inside our hearts all the way into Life. This is the throne of heaven; this is how we “overcome” all things. Reading through “Until My Enemies,” Chapter 16/18 of The Covenant, just now, I see that I am attempting to re-iterate what I said much more clearly there. You may want to read through those seven chapters again yourself. We are simply using another model to see the same revelation of Jesus Christ revealed now through us. That's pretty cool. We don't look through two eyes of fire, but seven. What is this scroll? I have heard a number of explanations, some anointed and some intellectual. The short answer? I don't know. The longer answer – we can place this scroll where it is. We do not read this vision of John as either a chronological or a logical progression from Chapter 1 to Chapter 22. Rather, it is a series of layers, of springs flowing forward and back, of differing approaches to the same truths. In fact, John's vision is much like how I like to tackle knowing Christ our life, and that is to come at it from all kinds of different directions, jumping from one view to the next without trying to be “logical.” That's my approach even to the teaching of writing. I find it far more effective and real than the “textbook” approach. I now see Chapters 1 through 9 as a unit, with the two Throne Chapters as its center. All things proceed from that throne. Thus “to overcome” goes in both directions. First, it proceeds through the seven overcomes to the revelation of Jesus Christ upon the earth in His body, that includes you and me, coming through weakness in many and seen by all. That is by calling those things that be not as though they are. At the same time, it proceeds into all the aspects of the original curse, that is, calling those things that are as though they are not. OVERCOME (the Mercy Seat that fills our hearts) flows from the throne in both directions at the same time. Thus, lets put the first verses on each side of the Throne side by side. And I looked, and behold, a white horse. He who sat on it had a bow; and a crown was given to him, and he went out overcoming and to overcome. – To him who overcomes I will grant to sit with Me on My throne, as I also overcame and sat down with My Father on His throne. Two nikes on one side and two nikes on the other. Now, the majority want to call the guy on the white horse “The Antichrist.” There are a couple of problems with that, however. First, there is no such thing as “The Antichrist,” and second, it is Christ alone, the Lamb-Slain, who “slays the wicked” with the breath of His lips. Five of the opened seals correspond directly to elements of the curse. Seal 2: “In pain you shall bring forth children” – brother killing brother. Seal 3: scarcity – “cursed is the ground.” Seal 4: death, with Hades as the wounded of death. Seal 5: “and you shall bruise His heel.” – the unfulfilled martyrs, waiting. Seal 6: the removal of the skin of the beast, the turning on of the lights – nowhere, now, to hide. If the wicked powers of heaven and the wicked powers of earth, operating out from the curse and ruling by the lie, are causing endless sorrow and death, robbery and murder, debauchery and perversion all across this earth, wouldn't breaking the lie and the curse that gives power to the evil be the thing to do? Two are left out of this particular picture: judgment upon the dragon (you shall eat dust, that is, human flesh) and judgment upon the beast (your husband will rule over you). Now, this brings us back to a statement I made in “Authority Revealed.” The end of the age is in our hands, the hands of the sons of God. A big part of “overcome” is the necessary judgment of God on that which must be judged. Judgment must come upon the wicked rulers of the heavens and upon the wicked rulers of the earth, upon the dragon and upon the beast. Creation cannot be set free any other way. If a wicked man is beating your child, you do not just keep placing lotion on your child's wounds between the blows. First, you put a stop to the wicked man! Then, the healing means something. Yes, Jesus raised Lazarus from the dead. But death still took Lazarus out. Do you see how satanic “Christian” thinking really is. And how is it that Salvation Revealed is not good for all these people that “need to get saved”? I can no longer comprehend “Christian” thinking; it is so absurd. Grace is not where someone goes after death has defeated them. Grace is God present in us NOW in all fullness and flowing out through us NOW into all creation. Grace is Man, that is, God manifest in the flesh, that is, God revealed. So, let's bring this to the main point of the Revelation of Jesus Christ. That point is the defeat of the lie and the overthrow of the curse. Thus, most of John's vision is focused on those two triumphs as God reveals them now through us. The lie said that Christ is not our life; the curse said that we have a life not His. What is the real meaning of our sitting down in a chair where we have no business being? It simply means that we do not know the lie, that we do not regard the curse. Christ is our life; we have no other life. Christ is the only Story we speak; Christ is in our mouth. How do we overcome? The prophetic Word of Christ which we speak, carried by the Lamb.